Camping: Yes. Rollingview Recreation Area at Falls Lake. Reservations: 1-877-7-CAMP-NC (722-6762) or go here. Land managers: N.C. Division of Parks and Recreation, N.C. Wildlife Resources Commission, U.S. Army Corps of Engineers. Note: Some or all of this trail is on gamelands and hunting is allowed. Learn about local hunting seasons here. Trailhead/Access: Rolling View Recreation Area and NC 98. Click on map below for specifics. 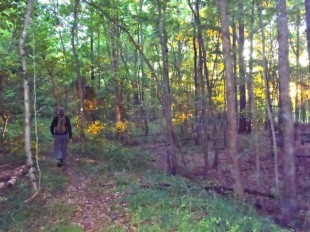 Hiking the MST at daybreak. The prospect of camping adds the dimension of backpacking to this stretch of the Mountains-to-Sea Trail. The Rollingview campground is among the nicest in the region, with sites well-separated in a rolling, forest tract that reaches down to the water. There are 35 tent sites and another 82 campsites with full electric and water hook-ups, a quiet respite compared to some of the significantly larger campgrounds found in state recreation areas. This campground may only open during warm weather months; call ahead before heading out. Geology Highlights: Along this trail section, look for examples of conglomerate (a sedimentary rock containing pieces of older rocks) and diabase (a hard, dark fine-grained igneous rock like that of the ocean floor). Junction with a blue-blazed trail, L, to a hiker’s parking area (Soon reach a pond and turn L to curve around it -> at 0.2. mi. reach a road, cross it and turn L to walk along a path by the edge of the woods -> at 0.3 mi reach the lot). Baptist Road by the gated entrance, R, to the Rolling View recreation area/campground.